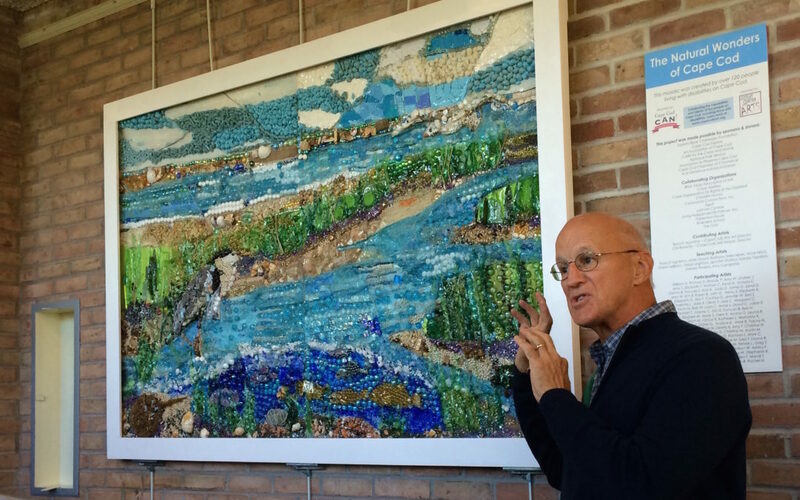 This project is a series of mosaics depicting “Natural Wonders of Cape Cod.” Scenes depict cherished locations such as Cape Cod Bay and the Herring River and wildlife, highlighted to encourage preservation and raise awareness of the need for their safeguarding. The mosaic was prepared by CapeCodCAN! participants during its Spring Art is for Everyone Program, under the direction of local Cape artists, then assembled and placed on public display at Cape Cod National Seashore Salt Pond Visitor Center in Eastham. It will eventually move to a permanent location at the renovated Station in Falmouth. Cape Cod Collaborative Arts Network (CapeCodCAN!) provides opportunities for people living with disabilities on the Cape to actively engage in the literary, visual, and performing arts, by collaborating with local Cape agencies, organizations, and individuals that serve this population.